That is not dead which can eternal buffer, And with strange aeons RALF may be implemented. And now for something completely different, a post about our favourite eldritch abomination (the word “buffering” should tell it all). I’ve decided to spend some time on RealVideo codecs. RM demuxer — the one in Libav is based on some scarce guesswork and does many things incorrectly (reporting incorrect FPS, reporting PTS while container stores only DTS, ignoring interleavers, selecting video codec by version reported in its extradata, etc.). I hope improve it a bit or kill trying. RV1/2 — our decoder is based mostly on guesswork, I’ve looked at it and tried to correct header parsing at least. For these codecs internal version number actually matters for bitstream reading. Another funny fact: Real didn’t develop RV2 fully by themselves, they based it on Intel ILVC sources (even some header from Helix distribution says it and I wondered why some functions in RV2 have Hive* names like in Indeo 4 and 5). Also decoder sports some artefacts related to motion vectors outside picture boundaries, maybe it will be fixed too. RV3 — there was a problem with chroma drift, it’s finally fixed. RV4 — there’s well-known problem caused by lack of weighted MC. I’ve finally implemented it, after some cleaning and related work on RV3/4 decoder it should appear in Libav soon. P.S. So far there are two codecs not supported by Libav, RALF (yet another pointless lossless audio format in its own special container too, or in slightly twisted RM at least) and ClearVideo (yes, it was possible to have non-RV there, anybody remembers that fractal codec?). While RALF is unlikely to be implemented ever (I think I wrote about it once), ClearVideo might be supported eventually but don’t hold your breath on it. That’s the question you may ask when you see what I’ve eaten. Since it’s August, it’s the best time to try the famous Norrlandish product (if you ever dare, most people don’t). I would lie if I say that I’ve eaten it all, I’ve managed to eat only two or three bits (with hard bread from Wasa and local milk). That should be enough for a lifetime. 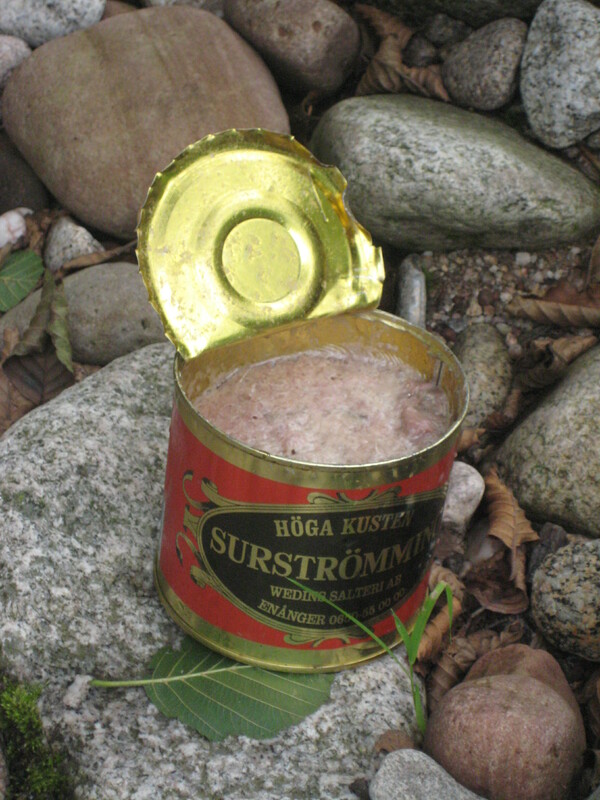 As for common beliefs: yes, it’s easy to open the tin without getting sprayed by fluid (though I wore a T-shirt with FFmpeg logotype just in case); the stench is not that vile (especially if you freeze or cool it before opening and you can bear garbage dumps in heat) though it’s definitely better to open the tin outside and away from houses and maybe catching cold; the taste is rich, salty and quite peculiar so it’s better left to the gourmets. At least it’s an excuse to drink a bottle of Trocadero. You are currently browsing the Kostya's Boring Codec World blog archives for August, 2011.